Partnership takes first steps towards deal on sophisticated new reactors. Russian nuclear power plants may be built in the UK very soon. This is a real prospect following the signing of a memorandum of understanding in the nuclear sphere between Rosatom and the UK Department of Energy and Climate Change. Other strong evidence of the seriousness of this statement is the agreement between the Russian State Atomic Energy Corporation (Rosatom), the Finnish company Fortum and Rolls-Royce, under which the partners will engage in the preliminary preparation of procedures for assessing the design concept of Russian nuclear projects in the UK, and licensing sites for a nuclear power plant (NPP). In order to enter the British market, the Russians attracted Rolls-Royce, as it has experience of working with local licensing authorities, and Fortum has experience in operating nuclear power plants in the EU. This is all about the first steps needed to obtain a permit to build a nuclear power plant based on a Russian design: the partners have made significant progress in negotiations for the construction ofreactors in the UK. This was reported by First Deputy Prime Minister Igor Shuvalov, who noted it was the issue of a strategic partnership of Rosatom and Rolls-Royce. “If such partnership is implemented, Rosatom and Rolls-Royce will be able to obtain the right to participate in the competition to build new reactors,” said Mr Shuvalov, adding that the Russian government would support this project. Rosatom showed interest in the UK market for the first time in spring 2012, when Germany’s RWE and E.ON withdrew from the Horizon Nuclear Power project for the construction of two nuclear power plants with a total capacity of up to 6GW in Wylfa and Oldbury. The state corporation was named among the likely buyers of their shares. However, in September Rosatom said it would not join Horizon. Now Rosatom reaffirms that the British energy market is considered attractive. Britain is the only country in Western Europe where there is a large nuclear plant construction programme (eight sites have been allocated); the rest have either suspended nuclear projects or, like Germany, decided to withdraw from nuclear energy. Alexander Uvarov, an independent Russian nuclear expert, said the British nuclear regulator was “very hair-splitting and conservative”, but would eventually recognise the technology and experience of Rosatom. What can Russia offer the UK in a new nuclear power project? 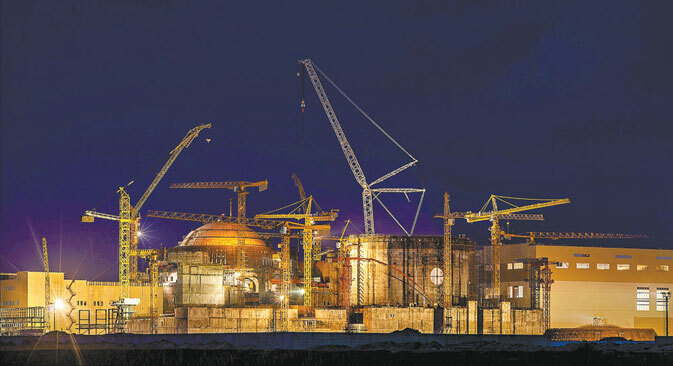 Unlike other NPP technology providers, Rosatom has never stopped building new plants. Today, it is implementing projects for the construction of nine power units with VVER reactors in Russia and 19 abroad. Rosatom’s power units are built according to the strictest post-Fukushima safety standards of the 3+ generation. Proof of the highest quality of Russian nuclear technology is the fact that the Finnish company Fennovoima selected Rosatom for the construction of Hanhikivi-1 NPP in Pyhäjoki in north-western Finland. The Finnish nuclear supervision authority, Stuk, is one of the strictest in the world. Finnish experts have chosen Russian technology because of its security characteristics and quality-to-price ratio. Russian nuclear specialists are offering to build the VVER-1200 unit based on the design of the NPP-2006 in the Hanhikivi-1 NPP. This machine meets all the requirements of the International Atomic Energy Agency (IAEA) and the EU. Today, six units based on this design are being built in Russia, two in Belarus, and four in Turkey. NPP-2006 belongs to the 3+ generation, meets post-Fukushima requirements and has a unique combination of active and passive safety systems. The Finns were the first in Europe to say Rosatom offered the world’s best energy solutions in the field of the “peaceful atom”. Rosatom’s technology is popular not only in Europe, Asia and America, but in Africa, too. Russia and South Africa are preparing to sign an intergovernmental agreement on peaceful nuclear energy, providing the opportunity to build Russian nuclear plants. South Africans selected the Russian NPP project because of its good price and highest level of security, confirmed by the IAEA.